This idea that public art can be a tool for community problem solving is central to the Public Art Challenge. Bloomberg Philanthropies announced that this competition, piloted in 2014, is launching a new round today. Mayors of U.S. cities are invited to collaborate with artists to put forward ideas for temporary public art projects that address a civic issue. At least three winning cities will receive up to $1 million each to help execute their idea. This year’s challenge builds on the previous competition in 2014, in which “Seeing Spartanburg in a New Light” was one of four winners. The winning cities demonstrated the power of art to bring creativity to problems such as abandoned property, environmental sustainability and promoting entrepreneurship, while strengthening local economies. Combined, installations in the four cities employed 820 people, engaged 1,300 volunteers and catalyzed $13 million in local economic activity. They also drew a total of 10 million viewers, who took a large but unknowable number of selfies. Local leaders in Gary, Ind., welcomed all the likes on Instagram. Their idea was to use art as an economic development tool. They took an underutilized building and turned it into a “social kitchen” called ArtHouse. On the outside, colorful solar-powered lights gave the drab facade an eye-catching sparkle. Inside, there were both art galleries and a job-training space for people interested in getting into the food business. The incubator graduated its first class of chefs and caterers in June. In upstate New York, three neighboring cities—Albany, Schenectady, and Troy—teamed up to highlight the revitalization potential of vacant buildings. In the windows of 166 of them, artists installed illuminated window panels that pulsed, as if the buildings were breathing. The project, known as “Breathing Lights,” sparked a region-wide conversation about renovating empty homes that blight striving neighborhoods. Los Angeles also wanted to provoke a conversation—about water. Launched amidst a drought, L.A.’s project included 15 installations in parks and public spaces along the Los Angeles River. At one, visitors could stroll through eight gardens planted with drought-resistant vegetation and then bring home a blueprint for how to plant one of their own. Last summer, dozens of free events tied to the project took place up and down the river. 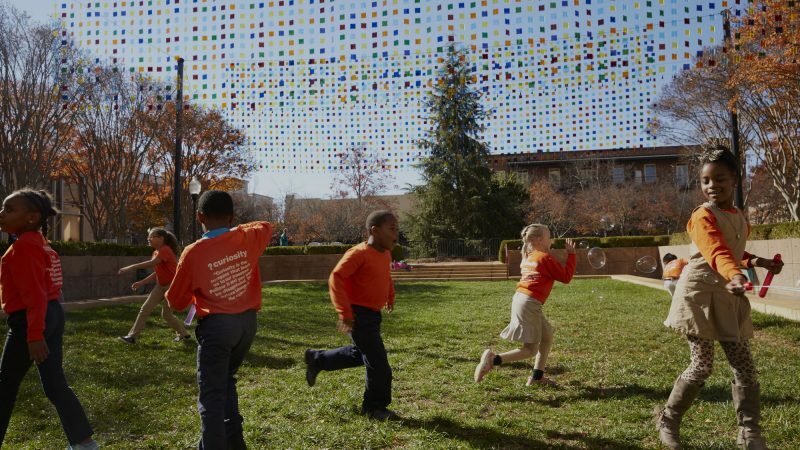 The 2018 Public Art Challenge is open to U.S. cities with populations of 30,000 or more. Mayors are encouraged to collaborate with artists, cultural institutions, community organizations and other stakeholders—and must bring additional financial resources to the table.